Ocean Shores Shim Jang Taekwondo Instructor: Dave Kee. Dave is a 2nd Degree Black belt. 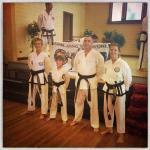 Ocean Shores Shim Jang Taekwondo Class welcomes students of all ages and levels of fitness. $78 per month. FREE TRIAL LESSON AND FREE UNIFORM AFTER SIGN-UP.